I created an E-design recently for a client in Tennessee who is expecting her first baby…a little girl! 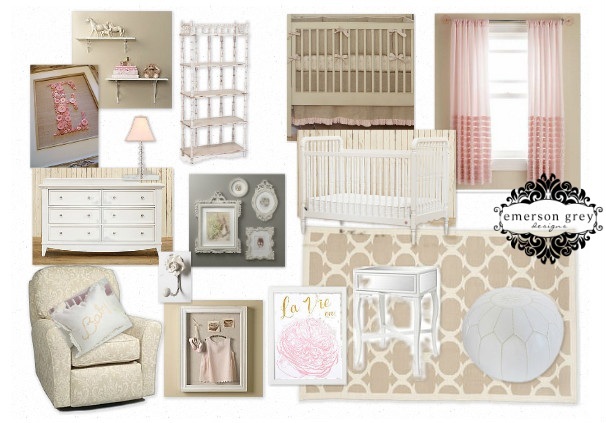 She is due in May and I can’t wait to “meet” her little lady and see her in her new room! This was a fun design to create partly because it changed a smidge half way through. This couple was renting in their area when they contacted me and sent me pictures of the room. I started the design process and then all of a sudden something exciting happened….they bought a house! So…the room changed. No biggie, design is always adaptable and I was up for the new challenge. Here is the design board and when they finally get to move in the new house in April, I will post the before and afters…I can’t wait! Can you? I have to say this was a fun design for me because it was so traditional. I tend to design more modern, clean line rooms, just out of my own liking, but I also want all to know I love all kinds of design. Sweet, funky, bright, calm, over-the-top, subtle…you name it…it’s so fun for me. Out of respect for my paying clients I don’t provide sourcing. Contact me with any questions. Darling idea board – soft, sublte and very sweet for a little girl!